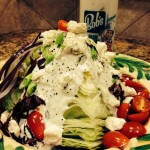 Blue Cheese Dressing Recipe - Homemade salad dressing is always best and super easy too! Mix all of the ingredients together - if the mixture is too stiff, add some buttermilk or milk to loosen it up. Refrigerate for 1 hour to allow the flavors to combine, stir again before serving - enjoy!